Vegans, flexitarians and omnivores love award-winning MISO MAYO for its full-bodied umami flavor and versatility. Delicious on salads and sandwiches, veggies and wraps, fish, meat and poultry - this Miso Alternative to Mayonnaise is perfect for daily use and outstanding for special occasions. Are you a food adventurer? Food lover with allergies or on a special diet? Try MISO MAYO - a unique and savory condiment that’s everyday delicious and excellent for parties, roadtrips and lunchboxes. MISO MAYO is plant-based and hand-packed in small batches to ensure quality and freshness. We use non-GMO ingredients sourced from trusted suppliers close to home. And MISO MAYO is always free from dairy, gluten, eggs, cholesterol and sugar. Contains Soy. Original MISO MAYO is a live food. 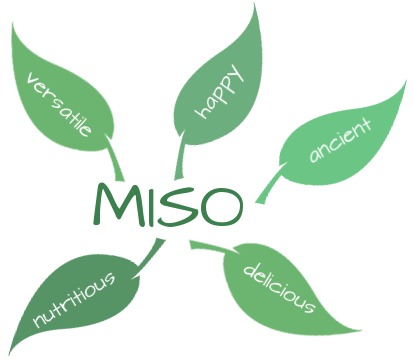 MISO - is a highly nutritious ingredient made from fermented SOYBEANS, prized for centuries for its gut-healthy organisms and delectable flavor. Giving Back: Giving Back: We support the nation's largest hunger-relief organization - Feeding America. This network of 200 food banks and 60,000 community food pantries and meal programs provides nutritious food to nearly 40 million people - including 12 million children and 5 million seniors - facing hunger across the USA. Join us in the battle against domestic food insecurity! "An intriguing new concept in condiments. Meet MISO MAYO, a vegan alternative to mayonnaise." "Nicely sharp and tasty, excellent to smear on a turkey sandwich, to use in chicken or potato salad or to mix with yogurt and herbs for a dip."